Tumble Forms 2 Rolls are brightly colored with adaptive shapes for rolling and rocking movements, and for positioning and neuro-developmental training. These soft yet firm rolls have a solid core to prevent flattening at the bottom (except the 4" size). Generally, they are most suitable for coordination training and for development of normal tone in the trunk in relation to upper and lower extremities. 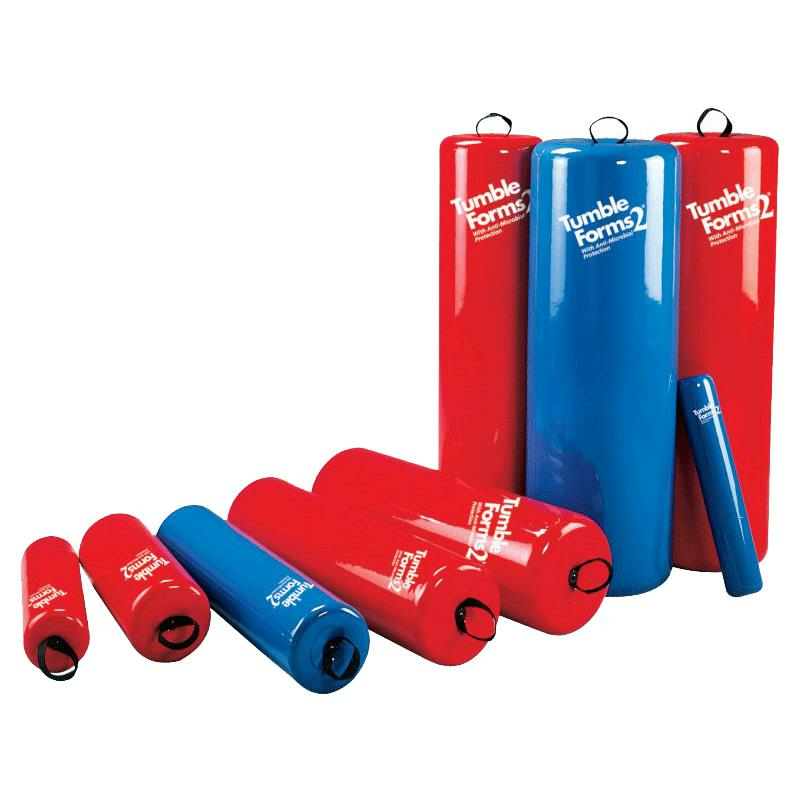 Tumble Forms 2 Rolls include strap for easy carrying and storage (except the 4" size). They are latex free and have no color choice. a. To stimulate head extension, arm extension, hip extension and knee flexion, place the child prone on appropriate size roll and interact with the child. For larger children place the child prone over 2 rolls of similar size. This added support allows for walking forward and backward on the upper extremities. b. Place a child astride the roll and position yourself behind him. Place the head and trunk of child on the roll face down and ask the child to slowly extend segmentally beginning with the head and neck to the degree the child can handle. Caution should be taken to prevent hyperextension of the head and trunk which could elicit abnormal movement patterns. To help prevent this, hug the child from behind, holding the arms of child above the wrist. The roll should be of a diameter that permits the feet of child to rest flat on the floor. "Prone Prop" the child on an appropriate size roll. Encourage reaching, grasping and releasing. Position the child on all fours (creep position) with the roll giving moderate support to the abdomen. Now shift weight bearing from knees to arms in an exercise pattern. a. Place the child in a sitting position on the roll straddling it. The roll should be of a diameter that permits the feet of child to rest flat on the floor. The thigh and lower leg should be at right angles to each other. The trunk should lean slightly forward from the hips. The hands are placed flat against the top surface of the roll between the knees. The child pushes up with first one foot then the other to simulate a rocking motion. As the motion continues the child should be able to compensate for the shifting position of the roll and maintain his original postural attitude. Gently rock the roll from side to side asking the child to maintain his original position on the roll and compensating for the shifting center of gravity. a. Straddle a roll in sitting positon and gently rock left to right to reduce muscle tone in the legs and feet. Staying balanced on the roll, position the legs out front to stretch hamstrings and abductors. To stretch the heel cords, place hips, knees and ankles at 90 degrees or greater. b. From a sitting position on an appropriate size roll, bang the child to a standing position to facilitate stretching of hamstrings while controlling knee extension and hyperextension. Sit the child beside an appropriate size roll and rotate trunk left and right. Build on rotation by gradually leaning sideways to the point of touching the floor on either side. The longer rolls make excellent seats for teacher and child during one-to-one instructional or sensory stimulation exercises. Working with flash cards or other instructional aids while the teacher and child face each other on the roll permits a more "intimate" atmosphere while encouraging balance control for the child. Develop tactile awareness with hand positions and then smoothly roll forward making trunk horizontal. Position the child in a kneeling posture allowing him/her to weight bear on the roll with both arms either flexed or extended. Rocking forward and back allows the child to gain control over hip flexion and extension. How will the Tumble Forms rolls help my child? They are used to create postural challenges during therapy. Sometimes called bolsters, rolls are fundamentally used where controlled linear rolling or rocking motion is desired. Rolls are most suitable for balance, extension exercises, forearm and hand control, coordination training, and the practice of weight bearing. Normal tone development in the trunk is a primary goal of using rolls with upper and lower extremity movement. Both dynamic and static use help improve muscle tone, range of motion, and perceptual skills. Do you not sell the large 18" or 24" rolls? Are you looking for Tumble Forms raised rolls? If so, please follow this link. They have 18" as well as 24" length.